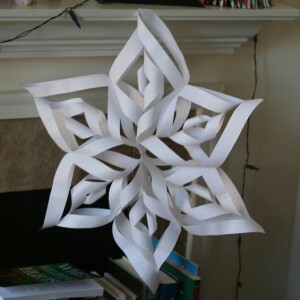 These 3D snowflakes/stars look suprisingly nice for being made out of printer paper and leftover wrapping paper. 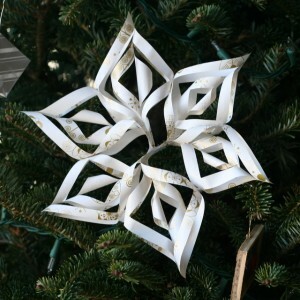 And they’re really easy to make, too – just paper, tape, and staples. The one on the left is about 10″ wide and made from scraps of wrapping paper. Smaller is better for flimsy paper! The one on the right is made from sheets of printer paper, and is almost 2 feet wide. I think these would look really cool dangling from a tall ceiling for a party, or perhaps as an ornate bow on a gift. If you want to make some, you can find the tutorial over here.